The following is the history of our club as related by "Professor Emeritus" Art Borgeau in 2012. The Philadelphia Judo Club is the oldest martial arts club in Philadelphia. It was founded in 1949, by Jack Feinsinger as The Philadelphia JuJitsu Club. The original location was the YMHA at Broad and Pine Streets. Being the first martial arts club in the city it enjoyed a certain amount of fame which included a television demonstration on the Today Show when Dave Garroway was the host. Traditional Japanese JuJitsu has no ranks so from an early point the club members would travel to New York to compete in Judo tournaments for rank advancement as students of Mr. Uchida’s Judo Club. Ultimately three of the original Philadelphia JuJitsu Club members went on to earn Black Belts in Judo. They were Al Wallace, Helen Foos, and Jerry Goldman. Of the three only Jerry Goldman is still alive. He is a 4th dan --Yodan, and because of his long history probably should be regarded as the Sempai (Senior) emeritus of the club. He is in his 80s, still single, lives in Cape May, and works summers as a blacksmith at Cold Springs Village. As a player he was famous for preferring ballet slippers to regular zori for the trip from the locker room to the mat. This caused the odd raised eyebrow or two, but no one ever challenged him on it. Blacksmiths are quite strong. Jerry was no exception. He once broke my nose during randori. Up to about his age 75, he and I would still occasionally visit the Cape May Coast Guard Gracie JuJitsu Club for a little Saturday afternoon fun and beat-up their players. After a time Jack Feinsinger discovered he could not make a living teaching JuJitsu so he sold the club to another instructor whose name has been lost to posterity. It was a short-lived association. The next instructor was Dr. I. Koiwai, a pathologist at Hahnemann Hospital and a 4th dan --Yodan in Judo. During his tenure the club became strictly Judo. The name was changed to The Philadelphia Judo Club, and the location was moved to the Chinatown YMCA. Not much is known about what happened during this period except that the three original Black Belts remained associated with it. In the early 1960s a huge development happened. This part of the story has more than one version. Over the years I was told both versions. There is truth in each. Takahiko Ishikawa, former two-time All Japan Champion and Chief Instructor for the Tokyo Police Department had spent a period of self-imposed exile in Cuba from Japan. This was during the Batista years. When Fidel Castro came to power Ishikawa was forced to leave Cuba. Since a return to Japan was out of the question, the USA was his second choice. After World War II, he had been part of a tour of Japanese Martial Arts experts promoted by General Curtis LeMay of the US Air Force. Philadelphia was a stop on the tour. He liked the city. With General LeMay and Helen Foos helping he returned. As a Hachidan (8th dan) he outranked Dr. Koiwai and instantly became the instructor for The Philadelphia Judo Club. There were ego problems between the two men. Ultimately the club split into two parts. The Philadelphia Judo Club moved to the YMCA at 15th and Arch Streets. For a time Dr. Koiwai remained the Chief Instructor there, then gradually ceded his duties to Jack Hunter, who ran things from the late 60s to the late 70s, when the club quietly drifted out of existence. Meanwhile Helen Foos, who was quite wealthy, provided the financial backing for The Ishikawa Judo Club. This was a role she would continue to fill until her death. In that sense she was a true patron of the arts. She was also a very remarkable woman. Keenly intelligent, highly opinionated, and often wacky, you either loved her, or hated her. Most people loved her. The first location of the Ishikawa Judo Club was at Broad and Race Streets, on the fourth floor of an office building later known as the Antonelli Building. The club was there from 1965 to 1970, and enjoyed its greatest popularity. Posted on the wall was an honor roll of club Black Belts ranging from Shodan (1st dan) to Hachidan (8th dan). There were 65 names in the honor roll. The highest was Ishikawa at Hachidan, and the next highest was Dr. Koiwai then at Rokyudan (6th dan). Even though relations were strained between the two men and Dr. Koiwai was the instructor at another club he continued to come to the Ishikawa Judo Club a couple of times per month until 1970, when the final blowup occurred between the two men. Ishikawa was the highest ranking Judoka in the world outside of Japan. In preparation for the 1972 Olympics, the United States Judo Federation, of which Dr. Koiwai was the President, decided to institute a standardized test for referees. It was the first time such a thing had been done. Referees were to be ranked according to the level of competition, the lowest being local, the highest being international – the Olympics or the World Championships -- and to officiate at that level they had to pass the appropriate exam. The United States Judo Federation approached Ishikawa about taking the examination. Here the stories diverge. The Federation’s side was that everyone had to take the exam, and by so doing Ishikawa would be validating the idea of better educated officials. That was not how Ishikawa saw it. He had no problem with the idea of an examination, but not for him. He was the highest man in the world outside Japan. He would not be examined by lesser ranks. If he participated it would be as the examiner, not the examined. Both sides had a point. Dr. Koiwai would never again set foot in the club. This ruined what little relationship existed between the men. The Ishikawa Judo Club resigned from the United States Judo Federation and joined the United States Judo Association, where the club remains to this day. Ishikawa’s personal life during this period was marked by darkness. His marriage ended in divorce. His son committed suicide. He developed terminal cancer. Things were out of control. The cancer was first diagnosed while he was on a trip to Japan. He was told he had less than two years to live. The diagnosis was confirmed in the United States. He went into a profound depression. The club dwindled. The lease was lost. However, all was not bad. Somehow during this time a miracle occurred. Ishikawa’s cancer went into remission and would never bother him again. He was in his mid-50s when it happened, ultimately he would live to be 91. In 1970, the Ishikawa Judo Club moved north to Broad and Callowhill Streets. However, Ishikawa was finished. He was just going through the motions. The club continued to dwindle. Finally in 1975, he threw in the towel. His farewell dinner in Chinatown was well attended. In his speech that night he stunned everyone by giving us one of the most naked moments with him we’d ever experienced. He said he was born in the year of the Snake. In the course of his life he had three dreams in which Snakes came to him. Two in Japan, and one recently. Each dream signaled major changes in his life. With this one he was moving to Virginia Beach. There Helen Foos would build him another judo club and he would remain with her until she died. He had been in Philadelphia for almost 15 years. He had touched our lives in a way none of us had ever experienced before. I once asked him what religion he was. He said, “Zen Buddhist, but I don’t practice it.” I said, “Why not?” He said, “Would you like to sit in seiza on a hardwood floor for forty minutes and have someone waiting behind you hit you with a stick if you moved?” I said, “No, of course not.” He said, “Me, either.” Still he was a true Zen instructor. Which meant, he would almost never answer a direct question. “Yes, I see,” he would say (invariably about some technique). “There are many answers. I think for you – go practice. Only two more years, you will understand.” And we would, too. Two years seemed like nothing. We wanted to spend the rest of our lives with Ishikawa. With his exit, the two clubs were finally reunited. The club once again became The Philadelphia Judo Club. The 6th Head Instructor was Rusty Scott. Rusty was in his early 20s, setting out in life, getting married, establishing a career. He wasn’t cut out to be a Judo instructor. The club was down to less than 20 people when he sold it to Bill Gaffney. Bill was a student at Temple at the time, and wasn’t even a Black Belt. He was still a Brown Belt. Since then he has taken care of that little matter. He has been a Black Belt for about 35 years. He is also a Silver Medal Winner in the World Master’s Judo Championship held in Tokyo at the Kodokan. Temporarily at the club he was able to stop the losses, but other bad things continued to happen. The owner of the building forced the club to allow an Aikido Club to share the space, thus forming a relationship we had not sought. On a more pleasant footnote, however, Bill lived in a house in South Philly. Randall “Tex” Cobb and I were also without a place to live, so we moved in with him. We spent a good winter there eating cheesesteaks, enjoying our girlfriends, playing cards, and drinking beer. I don’t think any of us did ten cents worth of Judo. Randall and I later moved out. Behind us two more guys from the club moved in. It became the Judo house for the next few years. In 1980, Bill Gaffney sold the club to J.B. Gross. J.B. was an ex-Marine who was badly wounded in Vietnam. He spent 18 months in the Philadelphia Navy Hospital. When he finally got well enough to move around he came to the Judo club and Ishikawa physically rehabilitated him. It was not a pretty sight. During this time J.B. and I became friends and workout partners. We stayed that way to our Black Belts. Then he went to Japan, where he played for five years at the Kodokan. He became a Godan (5th dan) there. From 1980-1983, he was the Club’s Head Instructor (and owner). On his watch the Club was kicked out of its Broad and Callowhill location and moved north again to Broad and Poplar, a decidedly less good neighborhood. Membership had dwindled to about five players before J.B. threw the towel in. He decided to go to Kathmandu, Nepal. There he became the Head Instructor for the National Judo Team of Nepal and took his team to the World Games in France. Because his job was of a political nature he was later kicked out of Nepal in a coup. Ultimately he wound up in Chaing Mai, Thailand as a Self-Defense Instructor and died there. In 1983, J.B. handed me, Art Bourgeau (5th dan – Godan), the keys to The Philadelphia Judo Club. I handed them back. He wouldn’t take them back. This went on until my wife intervened and said, “Keep the keys. You know you’re going to do it,” and I became the 9th Chief Instructor of The Philadelphia Judo Club for the next 25 years. My five students quickly dwindled to one. The mat was a disaster. The location was awful. There was no heat. No air conditioning. The roof leaked. The drinking fountain was a urinal we’d scrubbed out. And the rent came due on the first of each month. We raised a couple of thousand dollars to fix the mat, said to hell with everything else, and left it like it was. Things started to get better. It was a beautiful dojo. We had a eclectic mix of students. All of them had keys. On Friday nights some of the guys would go out partying, close the bars, then come back to the dojo and fall asleep on the mat in preparation for the 8 – 11 Saturday morning practice. God, I loved that place. We had so much fun. We stayed there for ten years. But once again we lost the lease. This time we moved back to the YMCA at 15th and Arch Streets, the former home of the Club. It was a good place to train. The mat was terrible, but we had a good room. We could open the windows when the weather was bad and it was like being in North Philly again. The students toughened up nicely. Everyone took pride in being able to survive on a mat that was a deathtrap. We had players who were more than passionate about Judo. They were insane. I was proud beyond words. We were about fighting. Nothing else mattered. The medals, trophies, tournaments, and honors we won during the ten or twelve years at the YMCA form a list so long as to be boring. We moved to Maxercise. For some time I’d been advocating cross training with Brazilian JuJitsu. Steve Maxwell was an incredible instructor. Our students thrived on this combination. When we had to leave the YMCA they offered us some great space at Maxercise. The dojo that our students built was great. Truly the best ever, but there was something about the place I never liked. The rest of it is history. It was not a good fit. Some relationships work better apart than together. Also, I was getting older. Health issues were beginning to creep in. My teaching was stale. One night my wife, who originally said, “Take the keys,” now said to me, “It’s time to hand them over.” She was right, both times, but she also knew the gravity of what she was saying. Since 1967, much of my life has been about pulling on a gi and stepping on the mat. The idea one day that would now no longer be the case was almost too hard to bear. The Philadelphia Judo Club is now in South Philly. 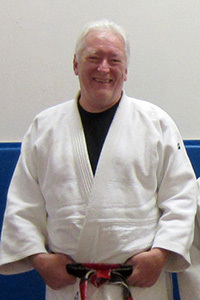 Ray Huxen (4th dan – Yodan) is the 10th Chief Instructor. Sometimes things work out like they should. Ray becoming the Chief Instructor is one of those. His Judo is young and fresh. His vision for the future is strong. He has a steady hand on the tiller, as they say in sailing. Maybe he and I knew this is how it would be the first night we met. Who knows? Our relationship is too on-going to write about, but I will say – You pass your most precious treasures to those you love and trust most. I know The Philadelphia Judo Club can look forward to a Great Future.